Any file that a user creates will be owned by that user, and this ownership is used to determine the total file size of all files owned by a user. We can set both soft and hard quotas. If a soft quota limit is hit, the user will not be restricted however the event will be logged. Instead of this, or in combination with, we can also set a hard limit, which will restrict the user from taking up any more space once the defined threshold is reached. For example, we could set a 900mb soft limit and 1gb hard limit on a group of users. Once any user owns more than 900mb of files, we can send out an automatic warning email, log an event, or optionally execute a command. 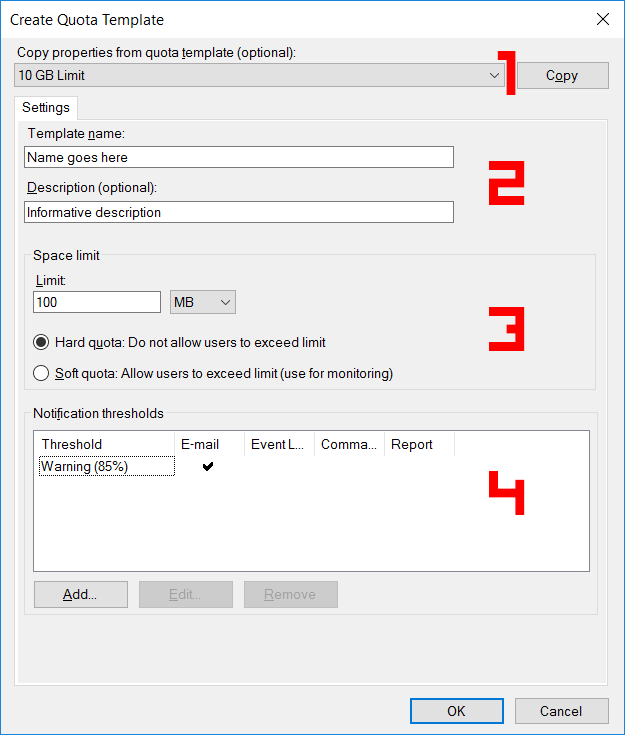 If no action is taken and more space is used once the user owns 1gb of files they will be prevented from using any more space on the file share. Again when this event takes place we can we can send out an email, log the event, or run some command, as we’ll see in the examples below. Now that we understand what quotas can do, let’s take a look at configuring some examples. 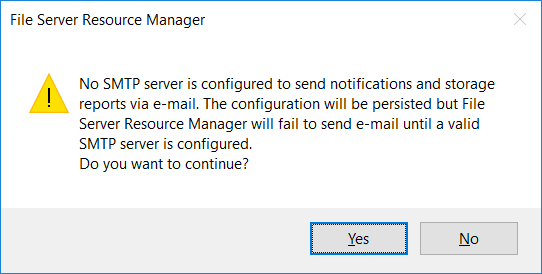 From Server Manager, select Tools and then File Server Resource Manager. To configure a quota, we must first create a quota template. This template will be applied to some specific directory later when we create the quota itself. We can view default quota templates available under Quota Management > Quota Templates. Each template will have it’s own soft and hard limits defined as well as unique actions that should take place if a limit is reached. We can either edit these existing templates by double clicking them, or select Create Quota Template to create a new one. We’ll create a new template here to walk you through all of the available settings. 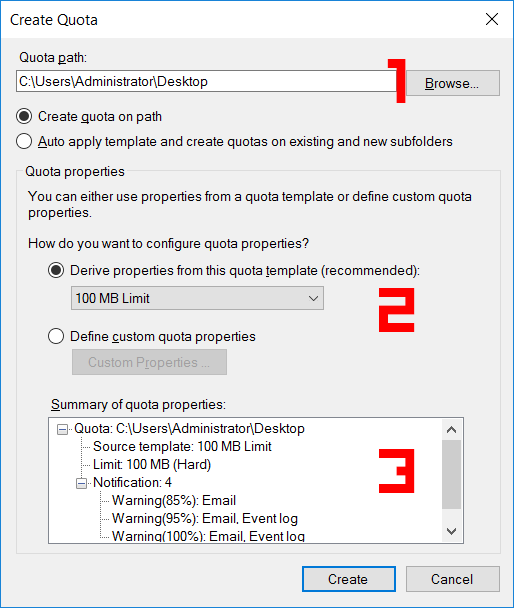 The image below shows you the Create Quota Template window, we’ll cover what each part does below. 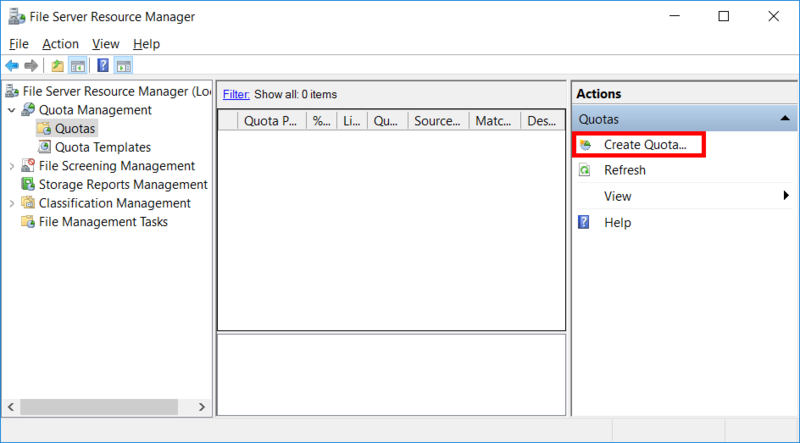 The first option allows you to import the settings from an existing quota template, this can speed up the quota creation process as you will not need to manually set everything. We can define a name and description for the template to help us identify it from the others. We can set a space limit in KB, MB, GB, or TB, as well as if the limit should be hard or soft. Finally we can create multiple notification thresholds by clicking the add button. These allow us to trigger specified events once the space in use reaches the threshold value of the space limit. In this example we have a warning threshold that will send an email at 85% of 100MB, which would be 85MB. When adding a new notification threshold, there are a few different options that we can choose. At the top we define the percentage of the space limit when we want the events in the threshold to take place. We can then pick what happens once the threshold is reached, including sending an e-mail, logging an event, running a command, or creating a report. E-mail Message: We can select if we want to send an email to a list of administrators, or send an email notification directly to the user who exceeded the threshold with a custom message advising them that they should remove files that are not required. 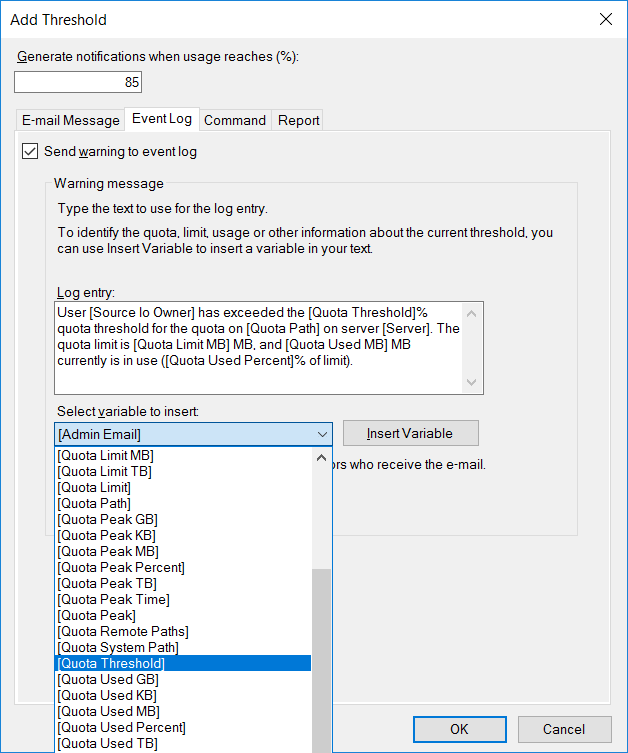 Event Log: We can optionally send an event to the event log, this may be useful if you have monitoring tools to check the logs for these type of events and generate an alert. We can also customize the contents of the log message, there are many variables available from the drop down allowing us to place all sorts of useful information into the logged message. Command: It’s also possible to execute a command or script along with specific arguments from a defined working directory. This may be useful if you want to automatically compress, move, or delete large or old files automatically when the threshold has been reached for example. We can also specify the level of privileges that the script runs with, which can be useful as different accounts will have different access over various files. 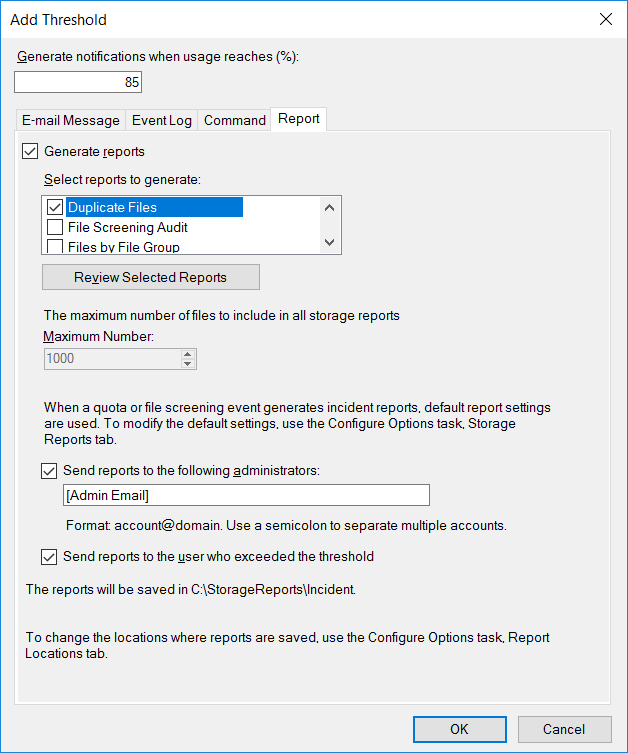 Report: A report can be automatically generated and sent by email to administrators or the user that reached the threshold. There are many reports that can be created which can help the recipient easily and quickly determine which files they own that are using the most space by various metrics. 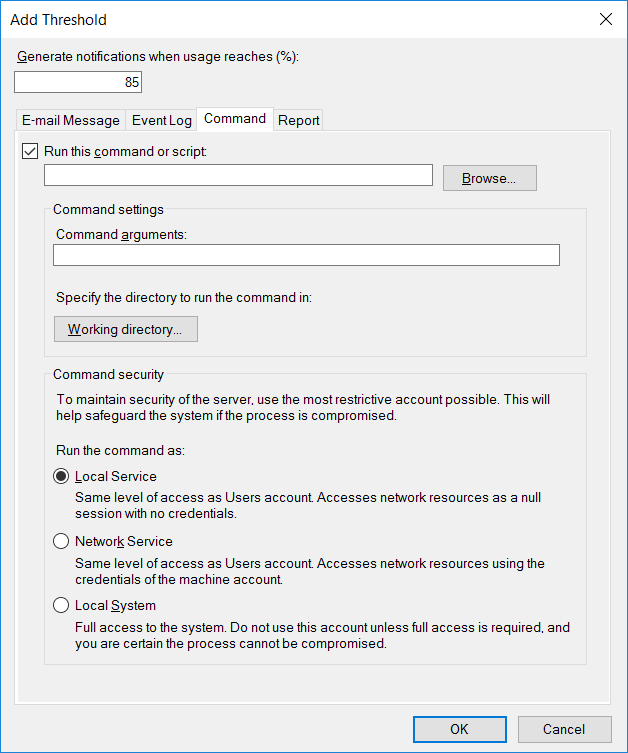 Note that to send mail, you must install and configure an SMTP server. You’ll be warned about this if you enable any of the mail options. Now that we have our quota template created, we can create a quota with it. This is done by going into Quota Management > Quotas and selecting Create Quota, as shown below. The image below shows the options available when creating a quota. The first option allows us to define a quota path. This is the location where we will apply the quota template to. By default the quota template will only apply specifically to the path, however we can optionally select to automatically apply the template to any existing and new sub folders recursively within. From the drop down we can pick the quota template that we wish to use. We can instead specify to define a custom quota template, this basically just opens up the create new quota template window that we walked through previously. Finally we can see a summary of all quota properties from the selected template, this gives us an overview so that we can get a brief idea of what the template is actually doing. 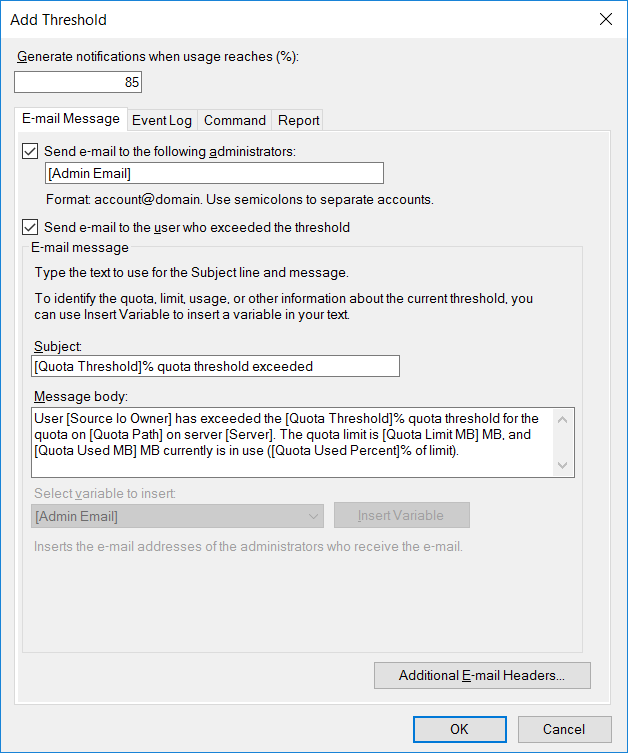 These quotas will apply to all users on the server with FSRM installed for the defined folders or volumes defined in the quota path. 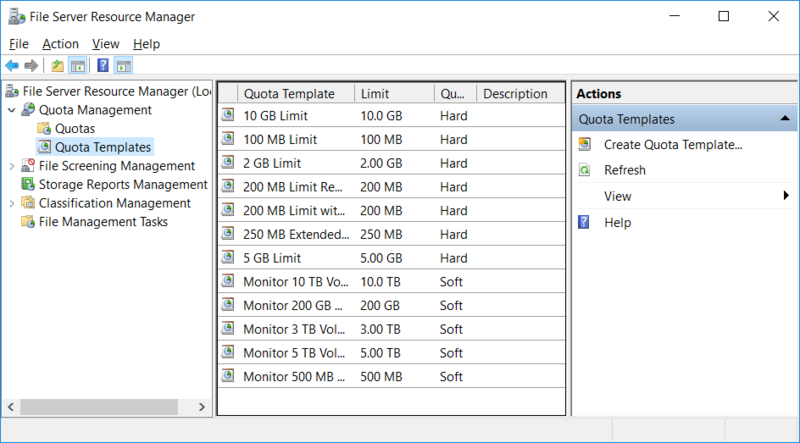 We can configure quotas with File Server Resource Manager (FSRM) in Windows Server 2016 to allocate a specific amount of storage space to users on a defined folder path, preventing a user from using more than their allocated disk space. This allows for the space to be evenly shared as defined, and for various events to take place once the soft or hard limit has been reached such as an email notification, event log, executing a command or script, or generating and emailing a report. 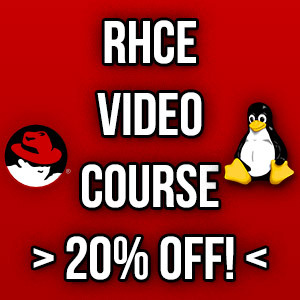 Now show howto have a 85% soft AND a 100% Hard quota on the same shared folder. Im still not sure you can do this – it has been missing since 2008.